the basics of aerial cameras, films, and filters as they apply toward remote sensing analysis. methods of aerial photo interpretation. the basic geometry of aerial photography. Photogrammetry is the science of measuring geometry from images. What that means, is that if we take a bird’s eye view of the downtown area, and we know the flying height, focal length, and other variables of how the photo was taken, we can accurately measure features from the photo, such as length of roads, area of land, or even elevation differences if we have overlapping photos. This picture on the right is of an aerial camera being installed in the nose of an airplane. This aerial camera is looking up the side of the nose, therefore, it is not providing a birds eye view, but a perspective view. Perspective views ,also called oblique views, are useful to capture images of areas you can apply directly over, want to show more information in a single photo frame, without flying higher. Notice how large the aerial photo cameras is. Old film aerial photo cameras used very large film formats. For instance, in the typical consumer film camera, film size of 35 mm. In an aerial photo camera, a film size the stress at a common film size is 240 mm, quite a difference in size, but also, quite a difference in quality. Aerial imagery has been a primary source of geographic data for quite a long time. Aerial imagery started almost as soon as portable cameras were invented and became practical with the invention of the airplane. As the camera was used more and more for aerial imagery, the science and profession of photogrammetry was defined. Using the radio control, the camera can also be pointed into a perspective view to take a picture like this. Even though these photos are not from as high of a height, they can quickly be launched, are cheap to create and maintain, and can help you view your surroundings from a different, higher perspective. Now that we are familiar with the concept of an aerial photograph, it is time to discuss how an aerial image is described. An aerial image has multiple attributes that are important to us as users. The first attribute, is the image scale. The image scale is the relative distance on an image to the distance on the ground. For instance, we would specify that a particular aerial image has a scale of 1 inch measure of the image represents 100 feet on the ground. With respect to scale of distances, images contain distortions typically not found on maps. Additionally, scale is not uniform across the image, and therefore, the scale is usually specified as an average scale. What that means, is that due to the way in which an aerial camera is designed, and the distortion inherent in collecting an image from a distance, we cannot say with certainty that 1 inch measure only image represents 100 feet on the ground anywhere on the image. 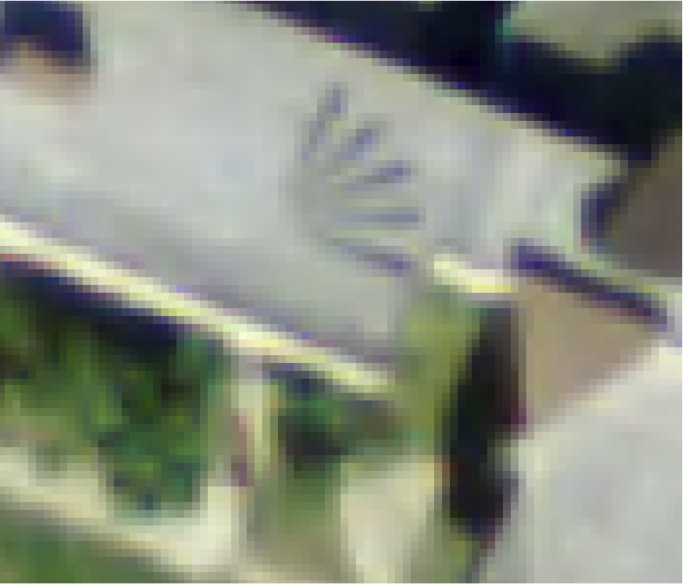 The second aerial image attribute is the extent; the extent is the area covered by the image. The extent depends on the physical size of the recording media, the lens system installed in the camera, and the flying high of the platform the cameras installed on. Extents can be specified in units such as square miles, or degrees of latitude and longitude, among others. The image resolution attribute represents the smallest object that can reliably be detected on an aerial photo. Typically, resolution is measured between two highly contrasting colors of adjacent objects that can give clues as to what the resolution of the images. Resolution will depend on the size of the films grain in analog cameras, and the sensor density and digital cameras. When testing an aerial camera to determine the image resolution, oftentimes, and alternating pattern of black and white lines are painted on the ground, the aerial cameras flown at a specific height, with specific camera settings, and then based on how clear the resulting images, the image resolution can be determined. Image resolution is defined as how many square units of the ground is covered in a single pixel in an aerial photograph. For example, a high resolution aerial photo camera, can take a picture at a resolution of 6 inches squared. This is an example of a photo test pattern painted accurately on the top of the building. The picture the right, was taken with a low resolution aerial camera, and the alternating patterns are fuzzier, and therefore, at a lower image resolution. he image on the left is from an aerial camera with a high resolution. That image, the alternating lines are very clear. Aerial cameras that still use film, are still quite common. In order to record different parts of the electromagnetic spectrum, the cameras use different types of film. There are three widely used types of film: panchromatic, true color, and infrared. The panchromatic film records the intensity of the returned energy and create a black and white photo. The positive took panchromatic image is that it is inexpensive, and has a wide exposure range. The true color film is sensitive to light across the visible spectrum. This requires three emulsion layers, one for each primary color of red, green, and blue. This makes the film were expensive, and to not have as wide exposure range as the panchromatic film. The third widely used type of film is infrared. Infrared film is sensitive to visible and infrared wavelengths. It is sensitive to difference in brightness, which makes it a high contrast image. Infrared film is widely used for vegetation mapping. Digital aerial cameras are quickly replacing film cameras as the sensor of choice. One major positive for a digital aerial camera is that it eliminates converting the film into a digital image through scanning. Scanners can introduce error in the photo. Instead of using film, digital aerial cameras use charge coupled devices, more commonly known as CCD’s, or a similar element depending on which technology is being used by the camera. The CCD is a rectangular array of pixels that responds to light and records the intensity of the range of the electromagnetic spectrum it is calibrated to record. It is possible to split multiple CCD’s across multiple lenses, or use multiple CCD’s with a single lens to simultaneously record different portions of the electromagnetic spectrum. The top image on the slide shows how reflected energy from the visible portion of the electro magnetic spectrum reacts with a three CCD system. In a three CCD system, there is one CCD for each primary color. A complex set of mirrors, and filters, redirect the primary colors onto its respective CCD. This creates three separate images, each reflecting the intensity of returned energy for the three primary colors. When those three images are laid on top of each other, they create a color photograph as we know it. The picture on the bottom shows a CCD on a circuit board. The CCD is placed, typically, behind the lens of the camera, so it can record the reflected electromagnetic energy. All aerial images contain geometric distortion. It is impossible to take an aerial image of an area without introducing some sort of error and distortion. Therefore, you should never use aerial imagery that is not been corrected for these geometric distortions. What you should use instead, is an orthographic photo. An orthographic photo is a photo that is been corrected for geometric distortion by a trained photogrammetrist and now shows positions of objects after being projected onto a common plane. This is now equivalent to looking vertically downward onto a scene from an infinite height. Viewing a location from an infinite height is the only way we can improve all geometric distortion. Since we cannot view from such a distance, photogrammetry is employee algorithms, and equations, to emulate the view from an infinite height. Contrary to popular belief, most aerial photographs do not provide an orthographic, or top-down view. Instead, they provide a perspective view, also called an oblique view, which is a geometrically distorted image of the earth surface. This is caused for multiple reasons, such as, not being able to reach an infinite height, and distortions in the camera’s lens system, or undesirable movement of the aerial platform while taking a photo. This image (below) shows an example of a perspective view of a building. We know this is a perspective view because we can see the side of the building. If this were a top-down, or orthographic photo, we would only see the top of the building, and the tops of all of the surrounding features. There are six primary sources of aerial image distortion: terrain, camera tilts, film deformation, camera lens, atmospheric bending, and other camera errors. The terrain, and camera tilts sources of air are considered to be the major sources that contribute the most amount of error. We will now discuss each one of these six primary sources of error in more detail. Terrain distortion, a major source of error, is often the largest source of geometric distortion. Terrain distortion is caused when the terrain greatly varies in elevation. A greatly varying in elevation, relief displacement is the result. That means, that the position of features on the image, are displaced from its original position, and, therefore, it’s position cannot be accurately measured. Returning to the image of the building above, this is an example relief displacement. The location at the top of tall objects are displaced away from the center of the photograph that means, that the true location of the building corner, measured at the top of the building, is displaced outward from its actual location. Taking another view, when we take an aerial photo, we are recording reflected energy onto a flat sensor, which is represented as a conceptual flat surface on the ground for the cameras pointed. Objects that exceed the elevation of the datum are displaced outward from the center of the photo. Objects that are below the datum, are displaced inwards towards the center of the photo. This means, that relief displacement is not consistent throughout the photo, and can vary greatly for each feature. The terrain distortions are radial in nature. That means, that as you travel further away from the center point of a bird’s eye view photo, the distortions grow greater. This relief distortion effects angles and distances on the aerial photo and is the major cause of non-constant scale on an aerial image. Therefore, he vertical aerial image taken over very terrain is not orthographic. Since there are very few perfectly flat locations on earth, that means, that virtually all vertical aerial images are not orthographic, show relief distortion, and do not have constant scale. A photogrammetrist will work with the photo to reduce these distortions. The second source of error, camera tilt, is another major source of error in aerial imagery. Camera tilt is when the optical axis points in a non-vertical angle, causing a non-birds eye view. This non-vertical angle result of a complex perspective convergence of features on the photo.In this illustration, the photo is not looking straight down at the grid, thereby providing a perspective view. This perspective you created perspective convergence, where the width and height of the grid cells shrink and converge at a point far off in the distance. To avoid this, it is important to always stabilize the camera, and have the pilot fly as smooth and perpendicular to the ground avoiding any sudden moves. In order to assist the camera and maintaining a perfect birds eye view, intricate camera mounting systems are devised that keep the optical axis point rightly below. The camera mounting systems are constantly measuring and adjusting for the three angles of rotation; pitch, roll, and yaw. This image illustrates the relationship between pitch, roll, and yaw in relation to the center gravity of an airplane. The other three errors, the minor errors, are radial lens displacement, systematic errors, and atmosphere distortion. The radial lens displacement represents the imperfections in the camera’s lens surface. If the lens is not perfectly formed, it will change the energies angle so that it hits a different part of the sensor. A systematic error, is an error that is constant across a system, or series of photos. Examples of systematic error, are a deformed plattern that the file should lie flat upon. If the pattern is deformed, then the film cannot lay perfectly flat, and the image is therefore distorted. Atmosphere distortion, is when the light waves are bent as they travel to the atmosphere changing their properties. If the properties of the light are changed, then the resulting image won’t display the true properties of light. To remove the geometric errors we spoke about previously, photogrammetry provides tools needed to remove this distortion from the photos. The correction process requires measurement of image coordinates, and their corresponding ground coordinates. Using that information, and photogrammetric methods, the end result is an orthographic image. And orthographic image is an image with terrain and perspective distortions removed, providing the highest possible accuracy with respect to the limitations we face when taking aerial photos. This image is an example of an orthographic image. This is an image with terrain and perspective distortions removed. The image still shows the perspective view of earth, however, the image has been modified through stretching and skewing to compensate for the errors inherent in a perspective photograph. There are three primary uses of aerial imagery: surveying topography, interpretation, and background use. Aerial images form the basis for surveying and topographic mapping. Aerial images properly corrected for geometric distortion, allow for accurate measurement of both horizontal, and vertical positions. Image interpretation allows experts to categorize what they see on the image and/or assign attributes to those features. Third, aerial imagery is often used as a backdrop for a map, to provide a nice visual context. For this section, we will focus on image/photo interpretation. In a future section, we will discuss how horizontal and vertical positions are derived from aerial image, backspace. The third primary use, use as a backdrop for map, will not be discussed as it is easy to understand and does not need further discussion. Photo interpretation is the process of converting images to information often through categorization or assignment of attributes. Trained interpreters use the size, shape, color,brightness, texture, and relative and absolute location of features to interpret images. To properly use the characteristics of the terrain to interpret the photo, the photo interpreters should first develop some familiarity with the features of interest. This familiarity is often done through the interpreters visiting the site portrayed in the aerial image. This is known as ground-truthing. The common results of photo interpretation is a thematic map. In order to make a thematic map, this requires that the interpreter establishes categories for the interpreted features to be placed within. Additionally, this requires the establishment of a minimum mapping unit. A minimum mapping unit, is an agreed-upon area that is the smallest of feature can be in be considered its own separate, significant feature. For example, if we are mapping tree stands, and within a large tree stand there is a significantly different tree. If the minimum mapping unit is, say, 10 trees, the next significantly different tree will not be isolated as a separate feature. Photo interpretation is executed by either on-screen digitizing, or hardcopy interpretation which is later scanned into the computer, and the digitized from.